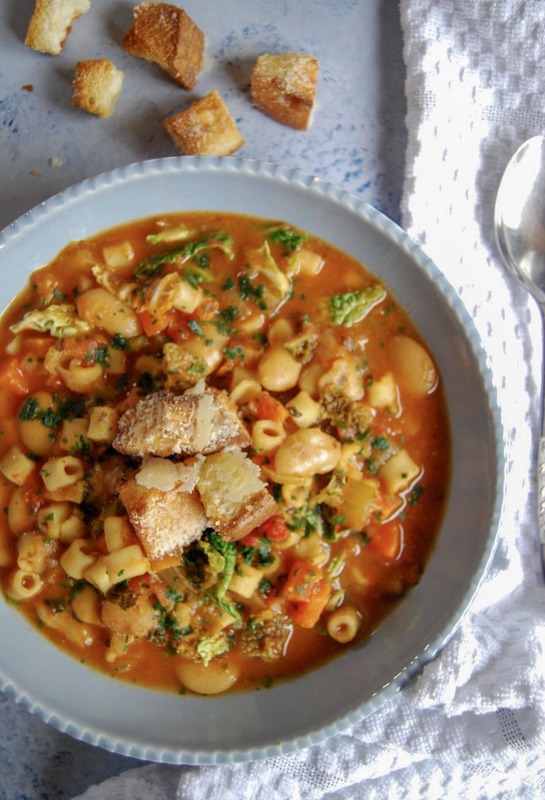 This filling and warming Instant Pot Minestrone soup is loaded with chunky veg, beans and pasta and is ready to serve in under 30 minutes! The weather has turned really cold again this week hasn’t it? I think the unseasonably mild weather we had gave us a false sense of security and made us think Spring was coming early, only for Winter to return with a vengeance. I spent Sunday afternoon watching my teenage son play for the local under 17’s football team. It was freezing. Note to self for next time – bring a blanket. And a hot water bottle. A flask of hot soup wouldn’t go amiss either! A cup of this chunky Instant Pot Minestrone Soup would have warmed me up in no time. I’ve made this soup twice in the last week and there are usually never any leftovers! It’s so warming and hearty. Perfect chilly weather food! White Beans. I use canned cannellini beans – they are such a time saver and dried beans would not work in this recipe. Shredded Savoy cabbage. You could use kale instead if you prefer. Vegetable stock (you can use chicken stock if you like but I wanted to keep this a vegetarian soup). Small (soup) pasta – I used Ditalini but any tiny pasta shapes will do. However….if you have any other veggies that need using up, do feel free to throw them in! I’ve made this soup with diced courgettes (zucchini), kale instead of cabbage, green beans, peas…you get the picture! I don’t have an Instant Pot – can I make this soup on the hob? 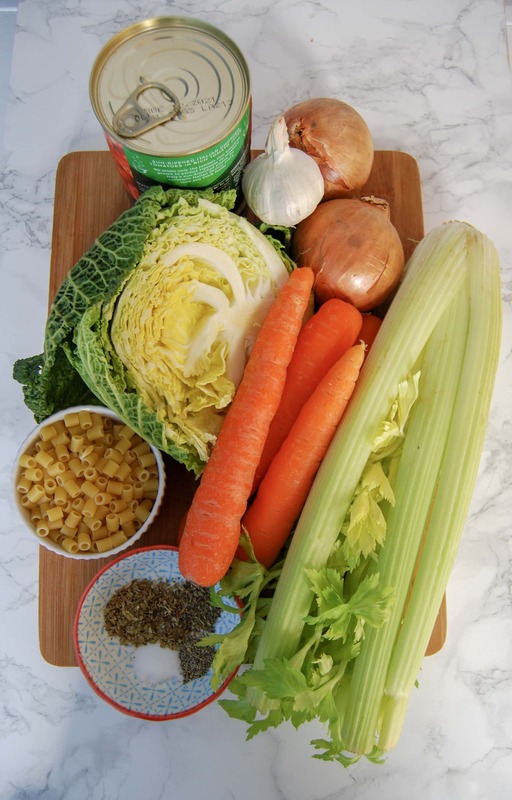 Yes – you don’t need an Instant Pot to make this soup! To make this Minestrone soup on the hob, heat the oil in a large saucepan, add the diced onion and celery and cook for 5 minutes or unti the onions have softened. Add the garlic and cook for a futher 2 minutes. Add the rest of the vegetables (EXCEPT the cabbage), the tinned tomatoes, tomato puree, stock and herbs. Bring to the boil, then turn down the heat and simmer for 15-20 minutes. Add the beans and pasta and simmer for 10 minutes or until the pasta has softened, adding the cabbage in the final 2-3 minutes. Taste the soup to check if you want to add salt and pepper, then ladle into bowls. Serve with freshly grated parmesan and croutons. Looking for more warming soup recipes? 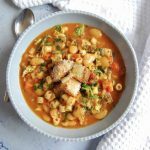 Pin this Instant Pot Minestrone Soup for later….. 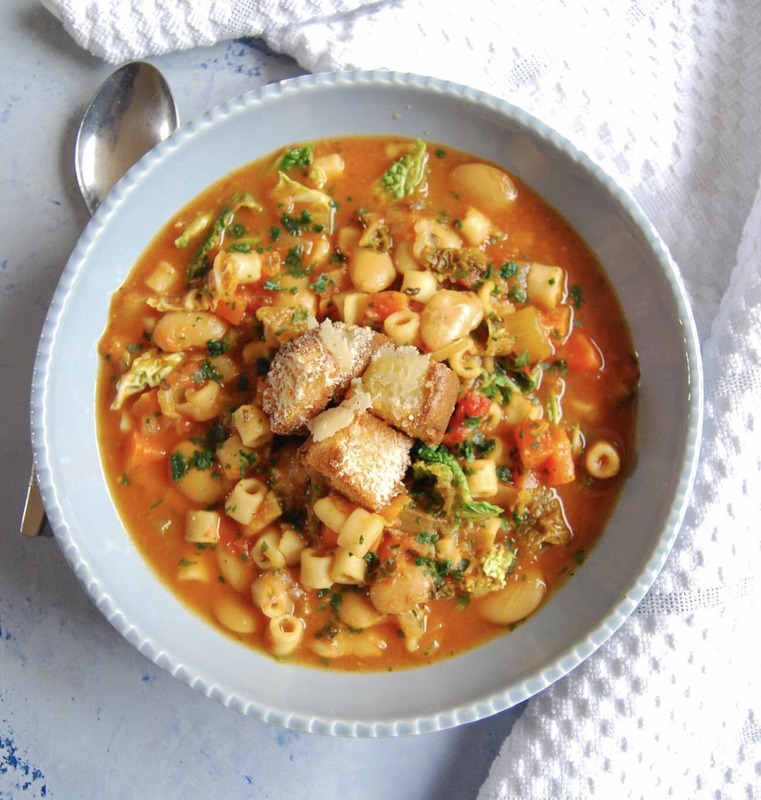 This Instant Pot minestrone soup is loaded with chunky veg, beans and pasta - sprinkle with lots of fresh parmesan cheese and top with crunchy croutons for a hearty meal in a bowl! Heat the olive oil and when hot, add the onion and cook, stirring for 2 minutes. Add the garlic and cook for a further one minute. Add the vegetable stock and cook for one minute, stirring to scrape up any bits that are stuck on the bottom of the pot. Stir in the celery, carrots, cabbage, pasta, beans, tomato puree, chopped tomatoes, salt, pepper and dried oregano. Lock the lid of the Instant Pot. Press MANUAL and cook on HIGH pressure for 8 minutes. Use QUICK RELEASE to vent the steam, then open the lid if you're serving the soup straightaway. Let the soup cool slightly before tasting to check if it needs Salt and Pepper. Ladle the soup into bowls, garnish with the fresh herbs and sprinkle with freshly grated parmesan cheese. Serve with crusty bread or croutons. I absolutely love soup and always make it in my Instant Pot, this one is going on my list! Thanks Camilla! I find the Instant Pot particularly useful for making soup. Thank you Jenny! I love curling up with a bowl of this soup when I’m freezing.